It's been a rich autumn in London for documentaries, culminating in the Grierson Awards earlier this month, the annual awards ceremony celebrating the documentary form, named after the pioneering practioner who first coined the term "documentary." It's a sign of the times that two of the winning docs came from the migrant crisis. 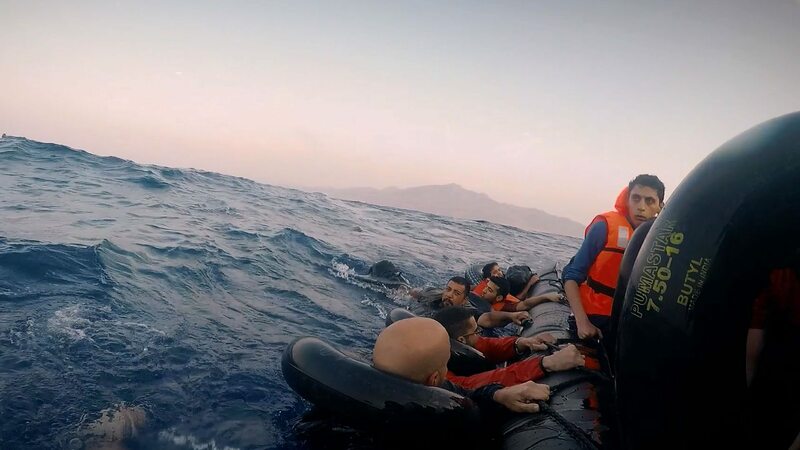 As the humanitarian crisis shows no sign of abating, filmmakers and broadcasters alike are struggling with how to tell the narratives emerging from the crisis in fresh ways. Both Grierson winners were stories filmed in large part by refugees fleeing Syria. In the BBC's Goodbye Aleppo, which won Best Current Affairs Documentary, four citizen journalists film themselves under siege in East Aleppo in December 2016. Against some stiff competition, the Best Documentary Series went to Keo Films' Exodus: Our Journey to Europe (Dir. : James Bluemel; Series Prod. : Jane Merkin), which tells a range of astonishing stories, tracking refugees from the shores of Turkey through harrowing sea crossings to their unstable lives in Europe. Coupling refugees' own escape footage with interviews, it makes for very powerful frontline testimony. To get a taste of it, check out this BBC extract from Exodus, which tells Hassan's story. Another notable award on the night included Best Constructed Documentary, going to Love Production's Muslims Like Us, for Channel 4, which placed ten Muslim men and women in a house together for ten days, including a convicted extremist and some hijab-eschewing women. Unfolding over two parts, the program, not surprisingly, contained a lot of conflict about what Islam means to modern Brits. Although Best Entertaining Documentary is a strange category to win, I was delighted to see the Channel 4 series 999: What's Your Emergency win a Grierson. Made by Blast! Films, it's always a superb watch, taking viewers into the heart of emergency care system, and tracking calls from origin through response, often through some compelling ambulance cab footage. This is one of a good half-dozen top quality medical series on British TV this year, which cumulatively demonstrate both the utter professionalism and quality of the National Health System, while at the same time showing how ever-dwindling resources and escalating demand have left it at a breaking point. Other outstanding hospital series include Label1 and BBC's Hospital, which, in its second season, found itself at the epicenter of a response to a terrorism attack. Check out this astonishing clip, and this one, as two of the victims—French school boys—reunite in hospital. Some months ago I was taking notes on a student film about the impact of a high-speed motorway on a community in the British countryside. A woman appeared briefly in it, telling us how the motorway would prove devastating for her family, including seven children, most of whom were on the autistic spectrum. She went on to reveal that her husband had killed himself and she was struggling to make ends meet. I made a note that she clearly needed a documentary all of her own. Fast-forward to the closing night of the London Film Festival last month, and the winner of the Grierson Award for Best Documentary went to Kingdom of Us, taking us deep into the lives of this very same family. Shot over three years by director Lucy Cohen, the feature film focuses not so much on the children's autism but on the ongoing impact of the suicide of their father some half-dozen years ago. It's a very moving gem of a story, with luminous filming, an abundant family archive and creative editing. No wonder it was snapped up during production by Netflix, where it can now be found. I am sure that it's a sign of the difficult present we find ourselves in, but for the rest of my LFF documentary viewing, I continued to seek out remote stories far from the noisy political landscape. Max Pugh and Marc Francis' Walk with Me takes us to southern France, deep inside a monastic community intent on leading mindful lives. Their Zen master is the revered Thich Nhat Hanh, whose readings are brought to life in voiceover by Benedict Cumberbatch. Immersive is an overused term these days, but this film comes close to doing the term justice. It's designed to be absorbed through a quiet pace and gorgeous cinematography, evincing the theme of slowing down, reflecting and communing. In a different kind of retreat, artist and filmmaker Steven Eastwood's Island explores the world of the dying. Filmed over a year at a palliative care hospice on the Isle of Wight, Eastwood focuses on four subjects, all near death; the youngest is 40 years old and has a young family. Like Walk with Me, the film is beautifully shot and proceeds at a quiet pace—completely appropriate to lives measured in moments and days, rather than months and years. Using the same material, Eastwood also launched a multiscreen project to complement Island, called The Interval and the Instant. The installation, in a former church in Brighton, projects a triptych telling the stories of the three main characters of Island, while a different screen in real time plays out the last five hours of one of the subjects. Eastwood's filming of the moment of death for one of his subjects is rare, but not unprecedented. Each semester, my Syracuse University London documentary class watches the BAFTA Award- winning 2011 film by Charlie Russell, Terry Pratchett: Choosing to Die. Pratchett, who had been diagnosed with early onset Alzheimers (and who subsequently died in 2015), explores the issue of assisted suicide, which is illegal in the UK. Prachett instead travels to the Suisse Clinic Dignitas, where he films the death of Peter Smedley, an ALS sufferer. What makes this such a teachable film is Russell's revealing chapter about the ethics of making it in our invaluable coursebook, Adventures in the Lives of Others: Ethical Dilemmas in Factual Filmmaking. Finally, in Tony Zierra's Filmworker, I enjoyed an astonishing 90 minutes in the world of Leon Vitali. A promising young British actor, he gave up acting entirely after a revelatory turn in the Stanley Kubrick film Barry Lyndon. Taken on as a right-hand man, Vitali worked tirelessly for the exacting director, a frequently thankless slog, covering everything from casting (his first job for Kubrick was to cast the role of Danny in The Shining) to obsessively tracking the whereabouts of every film reel. Zierra weaves together an embarrassment of archive riches with Vitali's colorful recollections, as he looks back with fondness on the defining role of his life. Their extraordinary working relationship ended with Kubrick’s abrupt death in 1999 while making Eyes Wide Shut; a documentary about the making of that film is next on Zierra's slate. Carol Nahra is a documentary consultant, lecturer and producer based in London. She teaches at Syracuse University, London and the Foundation for International Education. She blogs at www.docsonscreens.com.